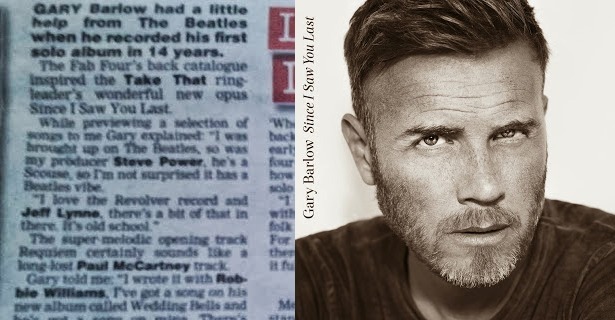 "Requiem" sounds"... like a long-lost Paul McCartney track" and that in Gary's own words: "I like the acoustic thing ... [the] last Take That album Progress had a lot of synths and drum mach­ines. I felt I want to strip things back again - no synths, all acoustic instruments." New single "Let Me Go" precedes the album on Sunday 17th November and tickets for Gary's 2014 solo arena tour go on sale at 9:00AM on Friday 11th October. The Deluxe Edition of "Since I Saw You Last" is currently available for pre-order via amazon.co.uk. ELO Beatles Forever [ELOBF] recommends "Let Me Go" and "Since I Saw You Last" by Gary Barlow to those enlightened folks who enjoy the music of ELO, Jeff Lynne, Roy Wood, The Move, The Idle Race, 'Brum Beat', The Beatles and related artistes. I always knew Shine had a E.L.O INFLUENCE. It is so obvious in the song. This article confirms every thing I feld .